Temperatures rose to above 30C yesterday (Tuesday), making it the hottest September day since 1921. The highest recorded temperature in Northamptonshire hit 30.1C at 1.28pm on Tuesday, with a total of 8.9 hours of sunshine throughout the day. Temperatures are currently sat at around 28C today. Pitsford Weather Station said: “Following the warmest September day locally since 1921, the heat is on for another day. 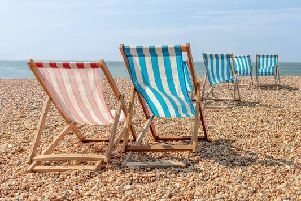 “The early morning mist will dissolve away to leave another fine and dry day with some lengthy spells of sunshine and temperatures once again climbing rapidly to around 28C. Although Thursday will start off dry, there will be the potential for some heavy and thundery downpours during the course of the afternoon.